Besides new dresses with white stockings and going to church on Easter Sunday with family the thing I most remember about Easter as a child is the Easter basket filled with goodies! My mom really went all out on Easter and we would all get a huge Easter basket each one filled with our favorite candies...mine chewy candy, of course! The reason alot of us associate Easter with candy is because Easter is the second most important candy-eating occasion of the year for Americans, right behind Halloween. Jellybeans did not become an Easter tradition until the 1930s. They were probably first made in America by Boston candy maker William Schrafft, who ran advertisements urging people to send jellybeans to soldiers fighting in the Civil War. Supporting our troops...love it! 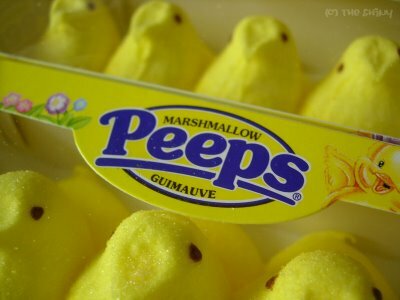 Each Easter season, Americans buy more than 700 million Marshmallow Peeps, shaped like chicks, as well as Marshmallow Bunnies and Marshmallow Eggs, making them the most popular non-chocolate Easter candy. So not a favorite of mine though! Adults prefer milk chocolate (65%), to dark chocolate (27%). Remember the health benefits of dark chocolate though!! Chocolate bunnies should be eaten ears first, according to 76% of Americans. Five percent said bunnies should be eaten feet first, while 4% favored eating the tail first.I have not had a chocolate bunny in years, but I believe I ate it ears first. Some supermarkets have doubled the space allotted to Easter candy in the past few years as the market has increased. I totally believe this...have you ever checked out Target's holiday candy aisles?! Now even as I am older I still get an Easter basket from my mom for Easter and I have to tell you I cherish it more now as an adult. You are never too old for an Easter basket!! *Just a thought...have you ever eaten a Reese's Peanut Butter Egg that has been in the freezer?? I highly suggest this...heavenly. The perfect addition to your fabulous candy buffet is customized candy. It's a memorable detail your guests will notice.